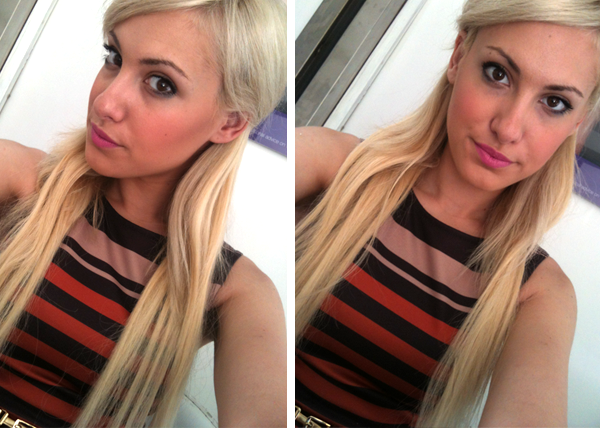 Bronzer is my favorite beauty product after lipstick it really is! I know how many are afraid of dark bronzers as they think it could look like mud on the face or what not, but I actually prefer it dark and blended well. 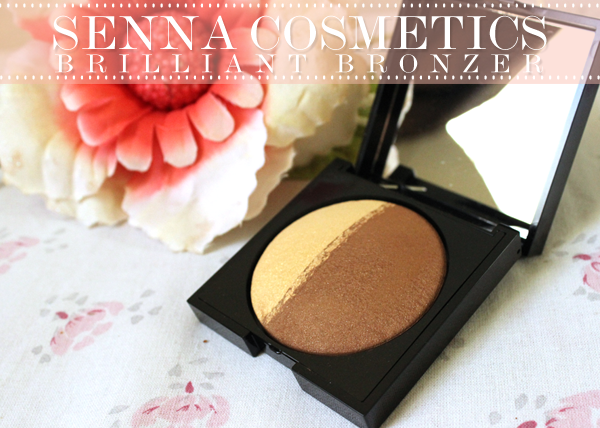 Senna Cosmetics 2013 Sunglow Collection featured two Baked Bronzers and the one I've been constantly using is SUNSET which is a "deep bronze & golden highlighter". When I looked at it in person the first time I instantly thought Chocolate and Vanilla ice-cream in a compact! The baked bronzer has some shimmer in it and even if I do prefer a matte bronzer, this shade does blend well with a blusher as it then adds a bit for youth and glow to the face especially in Summer. The highlighter is a gorgeous shimmery vanilla shade. It gives you a healthy glow without it looking too much for the mornings. As you can tell from the pictures I do contour my cheeks for definition and always add a blush and highlight for perfect cheekbones. Overall, this is a bronzer for those who are either tanned and want that lovely glow or for those who love that dark defined cheekbone. Some Pale Skinned might be afraid of this since it is in fact dark, but you can work with it and blend it out as it is really soft. The collection also came out with a Senna Cosmetics Powder Point 33 Brush to use when applying these bronzers to the face and It is great for contouring, reminds me of the Limited Edition MAC 165 Brush as it can really get into the hollows of your cheeks. Ingredients: mica, glyceryl caprylate, zea mays starch (zea mays (corn) starch), xanthan gum, glycerin, sodium anisate, sodium levulinate, synthetic fluorphylogopite, lauroyl lysine, silica, sodium dehydroacetate, pearl powder. May Contain (+/-): titanium dioxide CI 77891, iron oxide CI 77491 CI 77492 CI 77499, Red 7 Lake CI 15850. Net Wt. 0.20oz/5.9g. Made in Italy.